This heart healthy diet is directed to those who simply do not want to develop heart disease and to those that have heart disease and would like to reverse it. If you have heart disease, Dr. Esselstyn is emphatic about staying strictly on the guidelines of his diet and committing NOT to embrace the usual way of thinking that "I can go off the diet on special occasions" or "I can cheat just a little bit on the weekends." Dr Esselstyn has found that this "moderation" way of thinking is enough to prevent you from remaining free of the disease. Dr. Caldwell B. Esselstyn, Jr., MD is no ordinary individual! He was a member of the Olympic gold medal rowing team in 1956, a resident surgeon at the Cleveland Clinic in 1962, an army surgeon in Vietnam receiving a bronze star in 1968 and returned to the Cleveland Clinic as a surgeon until his retirement from active surgery in 2000. 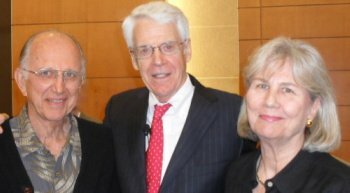 Dr. Esselstyn's first patient entered his cholesterol lowering program with a heart healthy diet in 1985 and by 1988 the cardiologists at the Cleveland Clinic had referred 24 advanced heart disease patients to him. An excerpt from Dr. Esselstyn's book "Prevent and Reverse Heart Disease" published in 2007. "Our local dietitians were skeptical about my theory, and several senior cardiologists at the Cleveland Clinic did not believe there was a connection between diet and coronary disease. Nonetheless I pursued my studies. In April 1984, I had a personal epiphany - and in effect became the first subject of my own experiment. 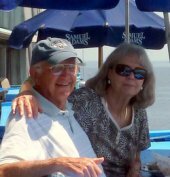 I was with my wife, Ann, at a meeting of the Eastern Surgical Society in New Haven, Connecticut. It was pouring rain...I was wet and uncomfortable - thoroughly disgusted with the day. And then a waitress served me a plate containing a huge, bloody slice of roast beef. Suddenly, I was repelled by the meat along with everything else. At that moment, I gave it all up - decided never to consume meat again. Ann ate every bit of that meal in New Haven. But it was not long before she, too, adopted a plant based diet. Ann's mother had died of breast cancer at the age of fifty-two. Then one day at an aunt's house, just as lunch was about to begin at her aunt's eighty-fifth birthday party, Ann's sister called. She, too, had been diagnosed with breast cancer at the age of forty-eight. After that phone call, Ann sat down and did not eat a bit of that lunch...and so she decided to join me in my dietary experiment. The Power of a Heart Healthy Diet! Between April and June 1984, my cholesterol level fell from 185mg/dL to 155. This was still not acceptable. Next, I omitted from my diet every possible source of oil and dairy fat (milk, butter, ice cream, cheese). Before long my blood cholesterol was 119mg/dL - without the use of any cholesterol lowering medication. This was especially reassuring since my late father, who had his first heart attack at age forty-three, had a total cholesterol as high as 300mg/dL...I was convinced that I could help others achieve similar results to mine, and that the effects on their health would be nothing short of dramatic." Many of you have probably heard Dr. Esselstyn's name connected with former President Bill Clinton in an interview with CNN's Wolf Blitzer concerning the former president's change to a plant based diet. As you may recall President Clinton, as a result of his love of fast food and a rich diet, had heart problems and elected to have a quadruple heart by-pass in 2004. Six months after the by-pass he had an additional procedure to eliminate scar tissue and fluid build up. In 2010, when the by-pass failed to work properly, two stents were added to help relieve the situation. At this point President Clinton looked for another way to return to reasonable health. His search led him to Dr. Esselstyn's book, "Prevent and Reverse Heart Disease" and Dr. Campbell's book, "The China Study". President Clinton has lost 24 pounds by pursuing Dr. Esselstyn's plant based diet and he plans to reverse heart disease by following this new heart healthy diet and lifestyle. He has realized, as thousands of others with extreme coronary heart disease, that by-pass surgery and angioplasty do not work to cure the problem. These procedures are at best a temporary fix. The underlying problem of the cause of the disease is not addressed. Thanks to courageous pioneers like Dr. Esselstyn, the "paper tiger" of heart disease can be stopped in it's tracks or reversed by simply eating heart healthy foods like we were designed to eat. This new heart disease remedy embraced by a former president will let you avoid having your chest cracked open...and your only cost is implementing a simple plant based diet. The history of medicine has forever been changed by the action of a former president and the ground breaking work of a dedicated physician. A heart healthy diet will eventually become a mainstream cure! If it happened to you or me, most people would never know of the healing properties of healthy eating and this simple diet. Of course nothing is 100% in this life. Some may need medications to keep their numbers in line in addition to following the plant based diet. This heart healthy diet is directed to those who do not want to develop heart disease and those who want to reverse heart disease. This diet, as well as the Hallelujah and McDougall diet, will work for other chronic diseases, acute medical problems and also if your are just trying to stay healthy. The following foods cannot be eaten if a heart healthy diet is to be effective. Anything with a face or a mother. This includes meat, poultry, fish and eggs. Dairy products that include butter, cheese, cream, ice cream, yogurt, milk and skimmed milk. Oils: All oils including olive oil and canola oil. Refined grains: White rice, "enriched" flour products that are found in pastas, breads, bagels and baked goods. Nuts: Individuals with heart disease should avoid all nuts. Those without the disease can consume some walnuts which provide considerable omega-3 fatty acids. The following are foods needed to promote heart health by a cholesterol lowering diet. Vegetables - Just about all vegetables are permitted on this plan with the exception of avocados. If you are a cardiac patient avocados have a very high fat content. Those that do not have heart disease may eat avocados as long as blood lipids are not elevated. Legumes - Beans, peas, and lentils of all kinds. Whole Grains - Just about any grain as long as it is "whole" grain. "Whole" means that it has not been polished or processed to eliminate much of the nutritional value. You should eat breakfast cereals that do not contain added oil and sugar. Breads should be whole grain without added oil. Whole grain pastas are allowed. You should be careful of restaurant pastas that almost always contain eggs, white flour and some oil. Fruit - Fruit of all kinds are permitted. It's best to limit fruit consumption to three servings a day. Also, avoid consuming pure fruit juices since you get excessive amounts of sugar that will elevate your triglycerides. Be careful of all desserts for the same reason. Beverages - The heart healthy diet allows the following beverages. Water, seltzer water, oat milk, no-fat soy milk, coffee, and tea. Alcohol is okay in moderation. Multivitamin - One a day that covers all the basic requirements. Vitamin B12 - 1000 mcg (micrograms) daily. Vitamin D - Those over 50 should take 1000 IU daily. Omega Fatty Acids - Consume one tablespoon of flaxseed meal each day. Perhaps sprinkling on your cereal. Keep flaxseed meal refrigerated. Cholesterol - lowering drugs (if necessary). These must be taken under supervision of a physician. Drugs may be needed if you cannot get your total cholesterol below 150mg/dL. Monitor your progress for the first two months with the help of your doctor. Have three to four tests. The first and third test should be a full cholesterol profile. The second and fourth can be total cholesterol only. After that, have the test done every two to three months. As your heart healthy diet progresses and your numbers get better, your doctor may reduce your medication and possibly eliminate it completely. Your total cholesterol target is below 150mg/dL. The following is the goal set by Dr. Esselstyn and the end result of following his program for a heart healthy diet. Total blood cholesterol should be 150mg/dL or less. LDL levels 80mg/dL or lower. This should be achieved by using strict plant based nutrition, and when necessary, doses of cholesterol lowering drugs. 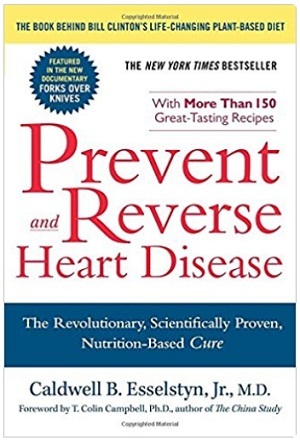 "EAT FOOD, NOT TOO MUCH, MOSTLY PLANTS"
Prevent and Reverse Heart Disease - The revolutionary, scientifically proven, nutrition based cure for heart disease.